DUGUA DE MONTS, PIERRE (also known as Du Gua and de Mons), explorer, trader, governor of Acadia, and founder of the first permanent settlement in Canada; b. about 1558 in Saintonge, France, probably at Le Gua; d. 22 Feb. 1628 and was buried near his home, the Château d’Ardennes, at Fléac (Fléac-sur-Seugne, France). 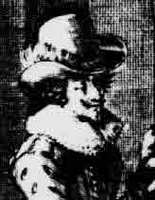 The son of Guy Du Gua and Claire Goumard, he married, on 29 May 1597, Judith Chesnel, by whom he had no children. A Calvinist, de Monts distinguished himself fighting in the cause of Henri IV during the religious wars in France. The king later awarded him an annual pension of 1,200 crowns and the governorship of the town of Pons in Saintonge in recognition of his outstanding service. De Monts seems to have made several voyages to Canada during the closing years of the 16th century, one as a member of Pierre Chauvin de Tonnetuit’s expedition to Tadoussac in 1600. France at the time was showing a growing interest in Canada as an area for both colonization and exploitation. Because of the depleted state of the country’s treasury, this work was being left to individuals under an arrangement whereby they would establish settlements in New France in exchange for the exclusive right to trade with the Indians. Few such settlements had been attempted before de Monts tried and all of them had failed. In 1603, de Monts was granted the privilege of trade and responsibility of settlement by the king. Under the terms of his commissions, he was given a trading monopoly and appointed lieutenant-general “of the coasts, lands and confines of Acadia, Canada and other places in New France,” there to establish 60 colonists a year and to win the Indians to the Christian faith. Early in the spring of 1604, de Monts sent three vessels to trade for furs on the St. Lawrence. Meanwhile, the work of fitting out the two ships he and his party would use to explore and colonize was rushed to completion. The first of these left Havre-de-Grâce (Le Havre) on 7 March, according to Lescarbot, with Francois Gravé Du Pont as senior officer and Capt. Timothée as sailing master. De Monts followed in Capt. Morel’s vessel on 10 March 1604. He arrived on 8 May at Cap La Hève (La Have) on the Nova Scotia coast where he waited for François Gravé Du Pont, who assessed the extent of de Monts’s monopoly before joining his leader. A few days after his arrival, de Monts discovered and captured the Levrette of Jean Rossignol for illegal trading in the area. As Rossignol and several Rouen merchants had equipped the vessel and obtained a permit to fish off the coasts of “Florida,” they took legal action against de Monts and in 1608 de Monts agreed to repay Rossignol’s expenses in recovering his ship as well as 900 livres in compensation for the seized pelts. The place of the capture de Monts named Port Rossignol. The next day, while they were exploring another bay nearby, one of the sheep fell overboard and was drowned, which prompted de Monts to call the place Port-au-Mouton. De Monts decided to remain here while his secretary Jean Ralluau and Champlain explored the coast south to the Baie Française (Bay of Fundy) in the ship’s boat. When these two men returned, the vessel was taken to Baie Sainte-Marie at the entrance to the Bay of Fundy, where it was left once more while de Monts and Champlain explored these unknown waters in the ship’s long boat. Delighting in the country as they explored the coast, de Monts and Champlain were especially pleased with the beautiful region now called the Annapolis Basin. Poutrincourt was later to express the wish to have the place and to one day settle there with his family. De Monts forthwith gave him the basin area, a gift later approved by the king. The explorers continued up the bay, seeking both a site for their settlement and a valuable metal deposit Jean Sarcel de Prévert had reported the previous year to be in the area. So it was that they reached Chignictou (Chignecto) and then turned westward to coast the New Brunswick shore. On 24 June they entered the mouth of a great river and they named it the Saint John, the saint whose day it was. In this search for a place to settle, fear of the Indians made them look for a spot that would be easy to defend. So they continued west along the coast, crossing Passamaquoddy Bay where they entered a river, coming probably on 26 June to an island that de Monts and his companions all seem to have felt suitable for their first settlement. Île Sainte-Croix (Dochet Island), as it came to be called, was chosen for its central position, its good anchorage, its ease of defence against attack, and because little time remained to prepare for the winter season. Angibault, dit Champdoré, the expedition’s pilot, was sent with orders for the two vessels and the rest of the men to move up to Sainte-Croix from the Baie Sainte-Marie. Work began almost at once and the rate of progress indicates both the careful preparations de Monts had made in France as well as the vigour of his leadership. 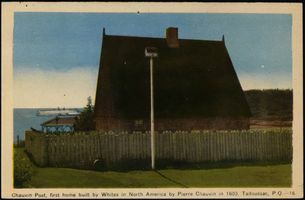 Following a plan drawn by Champlain, some dozen houses were built around a court, being connected in some places by a palisaded wall so that the whole settlement resembled a fort. It is of interest that some of these houses were partially built of lumber brought from France. In addition there were service buildings such as a storehouse, kitchen, and common living-dining hall. Also included was a Catholic chapel. While construction was pressed forward, gardens were planted both on the island and the mainland opposite, where the first wheat to be grown in New France was sown. Yet the season was already late and the harvest must have been small that first year. This was to be a very serious matter because the winter proved an abnormally severe one. The first snow fell on 6 Oct. 1604 and we are told it still lay three to four feet deep at the end of April. Even worse, ice floes in the river were so thick that it became dangerous – and sometimes impossible – to cross the river. The island was proving to be a prison. With supplies of fresh food exhausted, they were reduced to salt meat; fresh water was scarce and melted snow had to be used as a substitute. With the poor food and enforced idleness, scurvy developed and almost half of the men died of it. Spring brought an end to the wretchedness of the brave band. By March 1605, Etchemin (Passamaquoddy) Indians had started to call there to trade fresh meat and soon after the strongest men in the expedition were able to hunt game themselves. The arrival of warm weather also brought the supply ships from France with a relief party of 40 men under Ralluau and Gravé Du Pont. De Monts now decided to move his place of settlement. 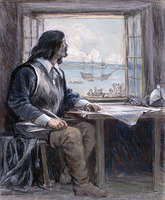 Champlain was sent on an exploratory trip down the New England coast with Panounias and his wife as interpreters and guides, but his report on settlement possibilities there was unfavourable. Orders were then given to dismantle the houses and carry them by ship to the Annapolis Basin, for building there not far from the present Annapolis the Port-Royal habitation. 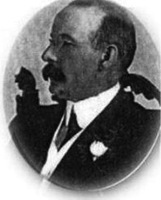 Once work was well under way, de Monts arranged to leave for France since recent news from home indicated his trading company was in financial difficulties and his monopoly in a critical condition. He left François Gravé in charge of the settlement because the Sieur d’Orville, a gentleman of some social standing who had joined the expedition and was to have assumed this responsibility, was ill from the effects of scurvy. Champlain was to direct further exploration. 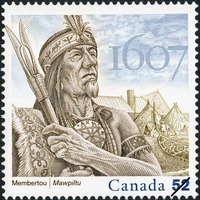 De Monts set out for France in September 1605, taking with him all but three of the survivors of the winter on Sainte-Croix – Fougeray, Champdoré, and Samuel de Champlain. When he arrived after a crossing of 31 days, he learned that many of the fur-trading merchants who were not members of the company were making a serious effort to have his trading privileges revoked. He quickly came to the decision to remain in France to better protect his company’s interests. On 13 May 1606, having secured backing from the famous La Rochelle merchants Macain (or Macquin) and Georges, he sent out a ship to Acadia with supplies and a new party of men, including Jean Ralluau, Marc Lescarbot, and the young Charles de Biencourt, under the command of Jean de Poutrincourt. His orders were to take charge of the Port-Royal colony and to continue the search for a better situation for the colony to the south. The party arrived late (the end of July), to find that the bulk of the good furs had already been taken by Basque interlopers. At Port-Royal, François Gravé was able to report success in the growing of grain and other food, although he himself had concentrated on exploration, but 12 more men had died of scurvy during the winter of 1605–6. While Guillaume Des Champs, the surgeon, had performed autopsies he had failed to discover the cause of the dread disease. The next year, to keep the men active and interested, the Order of Good Cheer was formed; because of it and the mildness of the winter, scurvy claimed only seven victims, but bad news was to arrive with the spring. 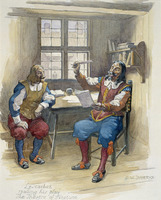 De Monts reported in a letter sent out with Jean Ralluau in 1607 that the opposition of the merchants of Saint-Malo not included in the monopoly and of the Duc de Sully, and the intrigues of the Paris hatters’ corporation, had caused the king to revoke his privileges. Champlain, Poutrincourt, and the others were to return to France. That fall, the affairs of de Monts’s company were wound up. The final accounting showed that during its three years of activity revenues had been high but costs even higher. De Monts’s loss alone was said to be 10,000 livres. The chief reason for the failure was the volume of the illicit trade in furs. In 1604 alone, for example, at least eight vessels had been seized for trading with the Indians without licence, and many times that number had not been apprehended. It must be remembered that those who traded illegally did not bear the burden imposed on the de Monts company to supply colonists and their necessities. Happily, de Monts succeeded in having the monopoly extended for one more year, 1607–8, on his pledge that he would establish a post on the St. Lawrence and renew his efforts to colonize the new land. Money was raised for a new expedition, organized by Lucas Legendre, of three vessels. One was to go to Port Royal (under Angibault, dit Champdoré), a second to the lower St. Lawrence, and the third to found a post at Quebec under the direction of Champlain. A modest profit was realized from the trading venture and, more important, the station actually built at Quebec was both a post for trade and a base for exploring the country to the west. However, the monopoly was not renewed at the end of 1608, partly because of the lack of success there had been in colonizing under this system, in force since 1600. The fur trade was now thrown open to all. With the establishment of a system of free trade, de Monts was granted a compensation of 6,000 livres, but this money was never actually paid. Nevertheless, he and his partners, Collier and Legendre, decided to continue their operations. These were roughly divided into two phases with Champlain to continue to explore and have charge of the Quebec post while Gravé Du Pont took charge of the fur trade. It was during the 1611 season that de Monts arranged for a shipload of oak – the first timber to be exported from Canada – to be sent to France. Until the fall of 1611, de Monts regularly sent out ships with supplies for the colonists and goods for the trade in furs. The post at Quebec was maintained, contact made with new Indian nations, and the exploration of the country pressed forward. Yet all other traders could share in the trade with none of this expense. Operating as they were at a loss, de Monts’s two partners determined they could no longer afford to maintain the post at Quebec. With his unbounded faith in the country and his conviction of the importance of the work of exploration being undertaken by Champlain, de Monts determined that Quebec would not be abandoned. He therefore bought the shares of the others. In 1612 Champlain and de Monts succeeded in having the title of viceroy given to the Comte de Soissons and then to the Prince de Condé. Under their protection, de Monts organized a company with certain privileges. By now, any rights he had in Acadia had been given to the Marquise de Guercheville [see Biard and Jean de Biencourt] so that efforts were to be restricted to Canada where the new partners had won the monopoly. He continued to participate actively in the Canadian trade and to encourage the exploration and settlement of the country until 1617. After that he withdrew to his home, although he continued to be a shareholder in succeeding trading companies as late as 1622 when he and Cornelis de Bellois became members of that of Montmorency. Despite the tremendous contribution made by this far-seeing and broadminded individual to the development of Canada, he has seldom been accorded his rightful place in accounts of its history. 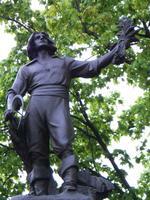 Here is the man who made possible so much of what Champlain accomplished. He it was who, inspired with the noble impulse of making a new France in America, founded the first permanent colony here. With his interest in trade simply as a necessary source of funds for colonization and discovery, he sacrificed personal gain for the greater goal, one in which Champlain was his staunch ally. From the day he and his valiant band planted their settlement on Île Sainte-Croix, the continent was never to be without a European settlement. It was de Monts who proved that people from Europe could live here permanently and that agriculture could be carried on successfully. Had his monopoly been enforced and maintained by the French government, the undertakings of de Monts in Acadia and Canada might well have succeeded in full measure instead of falling short of the goals he had set. In many ways the monopoly arrangement for the fur trade was a good one at the time for developing the country, in that it gave reasonable assurance of profits large enough to pay the cost of founding settlements and to allow shareholders in the company a fair return on their investment, while imposing desirable obligations respecting colonization. Yet those who ruled France did little effectively to support the trading companies. Spanish, Dutch, and especially French vessels in sizable numbers defied the trading monopoly with little risk, and the result was a drastic cut in fur-trading profits. What is more, jealousy prevailed, intrigue was rampant, and de Monts saw his exclusive trading privilege, granted for a ten-year period, revoked without just cause at the end of three. The monopoly system, even at best, could probably only have produced modest profits because of the high cost of placing colonists on the land, the quantity of supplies that had to be imported, and the expense of building and maintaining posts both for trade and protection, in addition to the regular overhead of a company such as that of de Monts. References make it abundantly clear, however, that de Monts was a man interested in commercial profit only as a means to develop a new domain for France in this great, strange land across the Atlantic. To de Monts must be accorded an important part of the credit for the fact that this goal was ultimately reached. AN, Minutier, XXIV, 229, 232. Champlain, Works (Biggar). Lescarbot, History (Grant). Mémoires des commissaires, I, IV, passim, and Memorials of the English and French commissaries, I, passim. Biggar, Early trading companies. Ganong, “Historic sites in New Brunswick,” 262–66. É.-H. Gosselin, Documents authentiques et inédits pour servir à l’histoire de la marine normande et du commerce rouennais pendant les XVIe, et XVIIe siècles (Rouen, 1876), 18–19; Précis analytique des travaux de l’Académie de Rouen (Rouen, 1871–72), 331. Francis W. Gravit, “Un document inédit sur le Canada: raretés rapportées du Nouveau-Monde par M. de Monts,” RUL, I (1946–47), 282–88. Pierre Du Gua, sieur de Monts; records: colonial and “Saintongeois,” ed. W. I. Morse (London, 1939), reproduces excellent documentary material on the subject. Guy Binot, Pierre Dugua de Mons: gentilhomme royannais, premier colonisateur du Canada, lieutenant général de la Nouvelle-France de 1603 à 1612 ([Vaux-sur-Mer, France], 2004); J.-Y. Grenon, Pierre Dugua de Mons: fondateur de l’Acadie (1604–1607) et cofondateur de Québec (1608-1613) ... ([La Rochelle, France ? ], 2001); and Jean Liebel, Pierre Dugua, sieur de Mons, fondateur de Québec (Paris, 1999). These well-researched works made possible the latest amendments. Registration records that would have provided the necessary details about the birth, marriage, and death of Pierre Dugua de Monts could not be located. George MacBeath, “DUGUA DE MONTS (Du Gua, de Mons), PIERRE,” in Dictionary of Canadian Biography, vol. 1, University of Toronto/Université Laval, 2003–, accessed April 22, 2019, http://www.biographi.ca/en/bio/du_gua_de_monts_pierre_1E.html.